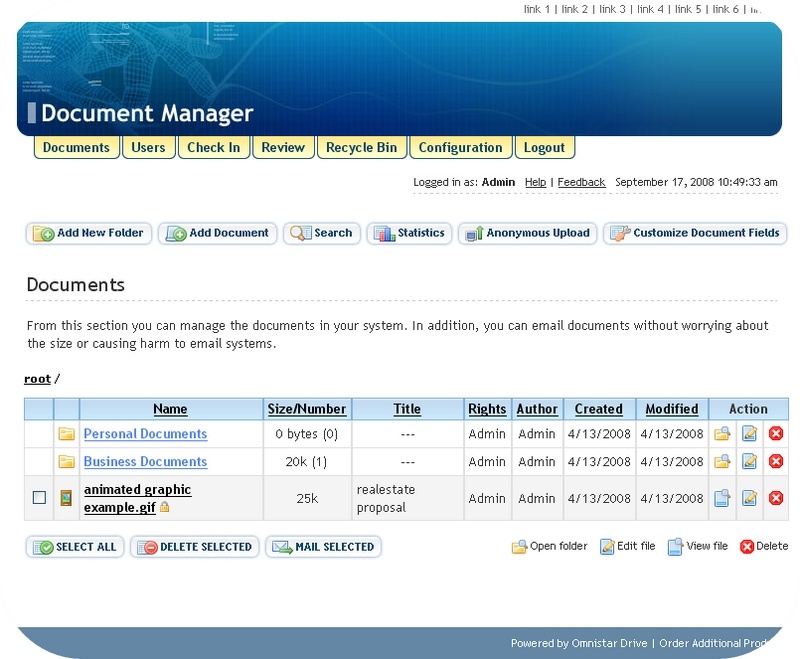 Omnistar Document Manager Software is a web based PHP document manager that allows businesses and webmasters to setup secure online file storage. Our web based document manager gives your users access to a document repository without using any additional software. Our web based php file manager allows you to upload large files with a Java file upload tool. We are dedicated to the success of our customers and pride ourselves in the highest level of support. Not only do we offer same day installs and support guarantee, but our customers can request a free phone appointment with a product specialist after they have used our online customer care center. Omnistar Document Management Software is a powerful web based file manager and storage utility. It was developed to give businesses and organizations the ability to effectively give other employees and customers easy access to files in a secure online repository. Check MS Office documents, Word, Excel. Storing and managing your home and office electronic documents. Qweas is providing links to Omnistar Document Manager 9.1 as a courtesy, and makes no representations regarding Omnistar Document Manager or any other applications or any information related thereto. Any questions, complaints or claims regarding this application Omnistar Document Manager 9.1 must be directed to the appropriate software vendor. You may click the publisher link of Omnistar Document Manager on the top of this page to get more details about the vendor.